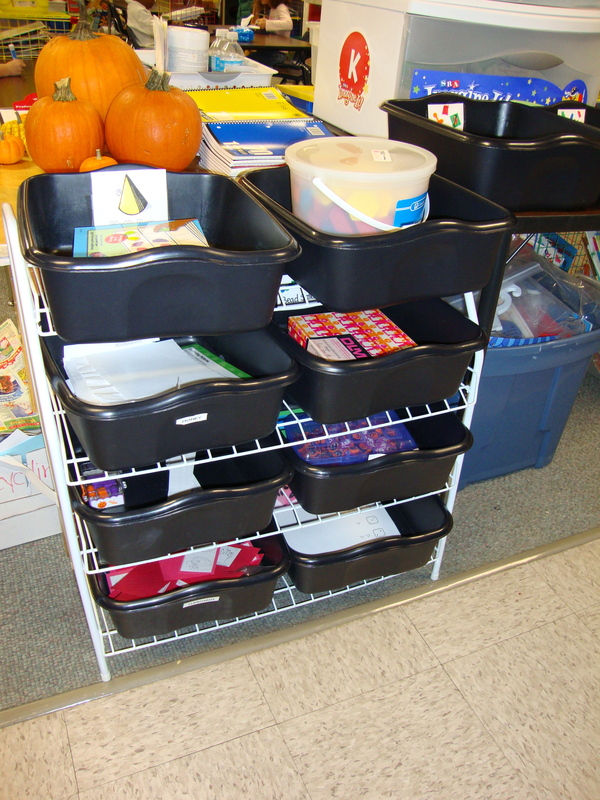 Here are a few pictures showing how I store my Math Work Stations. 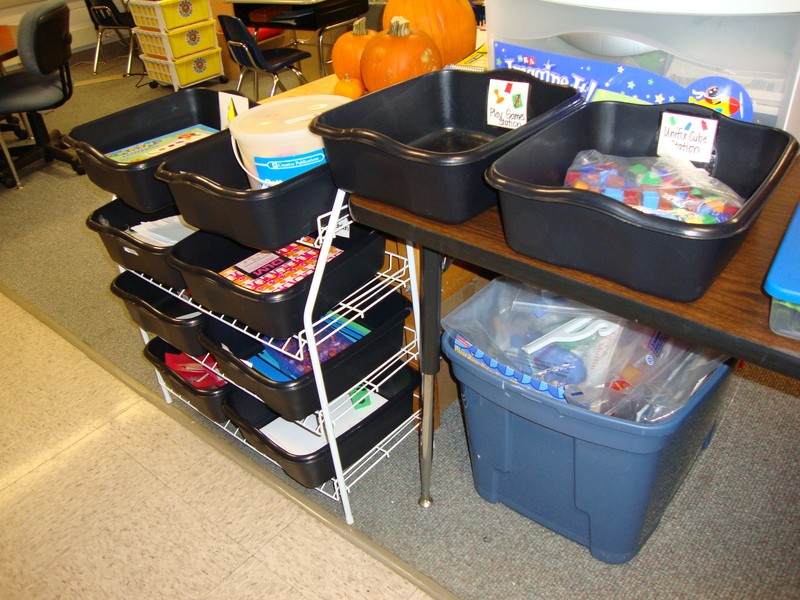 This was the easiest way I could think of that took up the least amount of room; considering we had Literacy Work Stations already going, Math Work Stations needed to be portable. 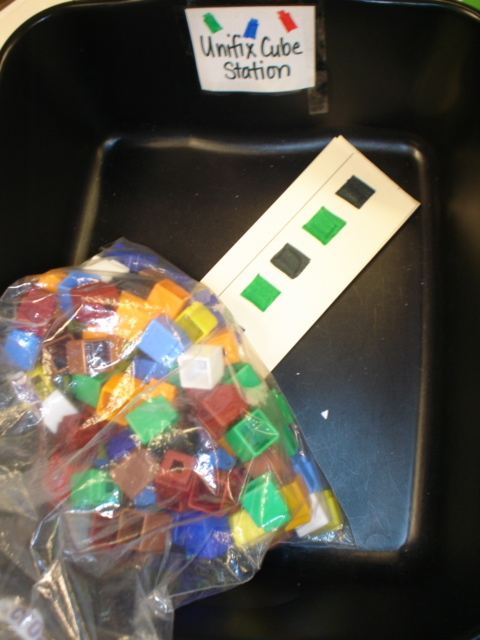 The children will be completing the patterns with Unifix cubes. 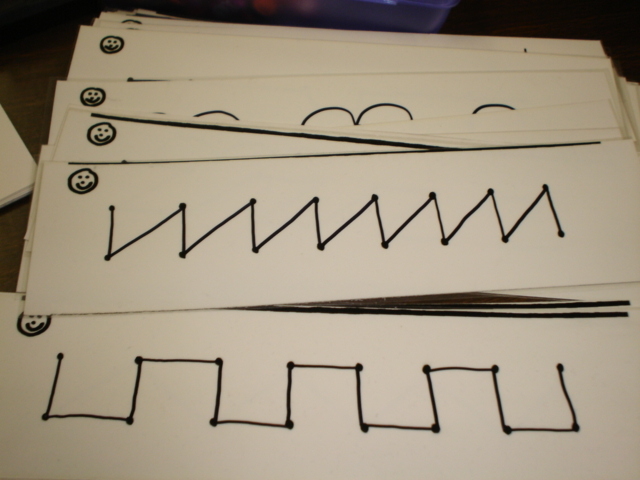 I drew the patterns on sentence strips with markers and just drew squares. 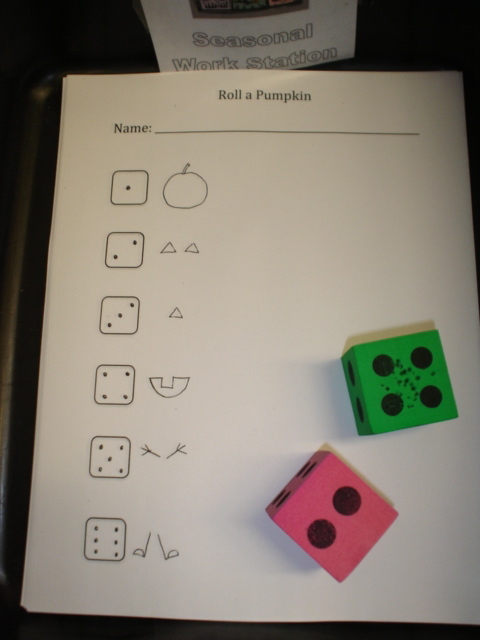 Manipulatives Work Station-the children will be completing the patterns with pattern blocks. 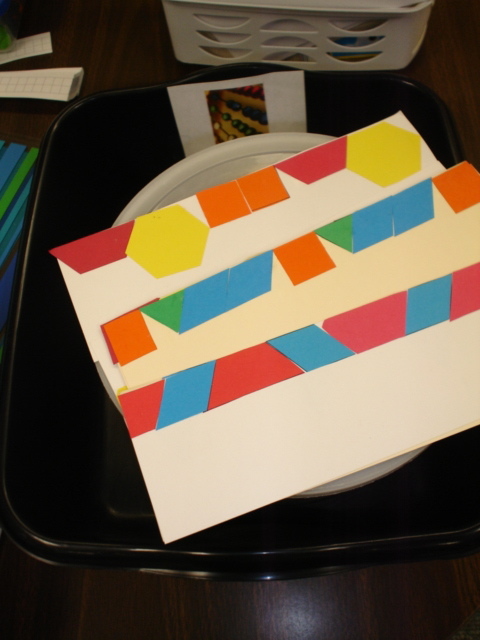 I created these patterns with die cut pattern block shapes. The idea is from Math Their Way. 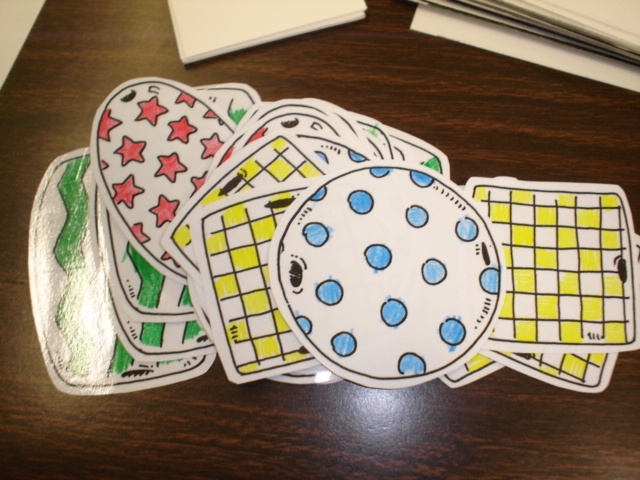 Pocket Chart Patterns-the children will make patterns with the beads in the pocket chart. I got the bead pattern from a book from Scholastic (you can see it here–looks like you can get a used copy for $9.50 on Amazon.com). 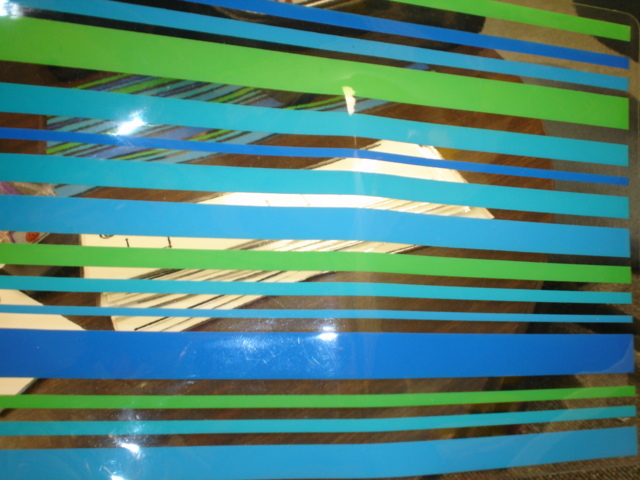 The children will be using dry erase markers to complete the pattern going on their own laminated dot strips. Again, from Math Their Way blackline masters. 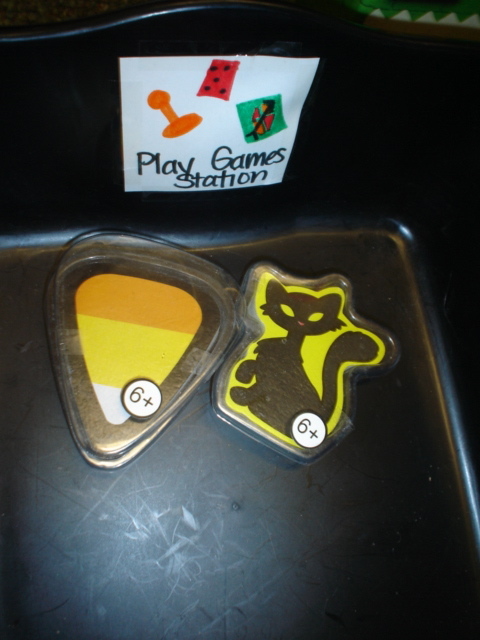 Eraser Pattern Station-the children will use the Halloween themed erasers (I got them in the Dollar Spot at Target) to make patterns on these placemats I got at Jo-Anns about 3 years ago. I cut the placemats in 1/2 because the kids were overwhelmed by the larger size. They will pattern along the lines of the placemats. 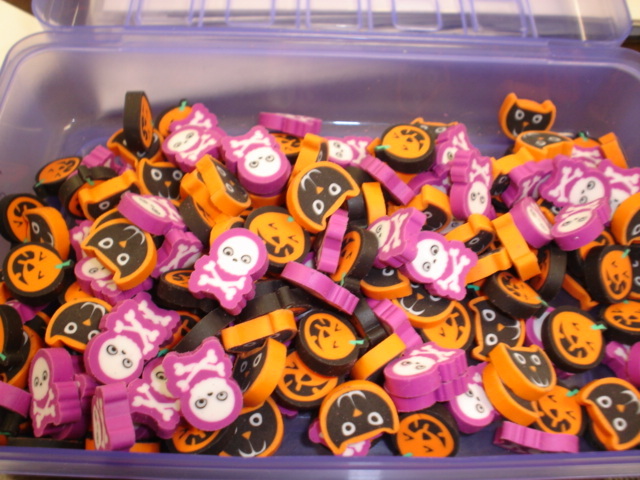 I posted these last year, but I always get asked where I get them from…They are from Scholastic and are little rubber stamps. 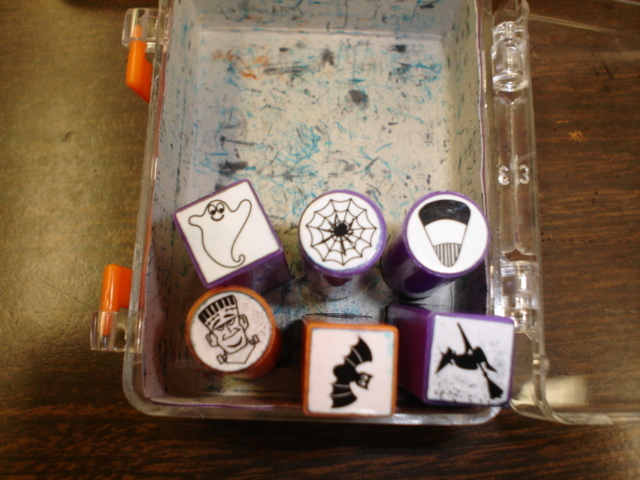 The children take grid paper and stamp patterns with them. The dollar tree has them around Valentine’s Day and other holidays so be sure to check there. 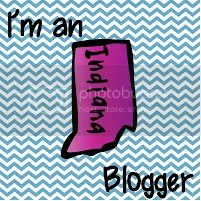 They are only a dollar for 8 stamps and an ink pad! These are pattern cards I got just last week from the September Scholastic SeeSaw or Firefly leaflet. 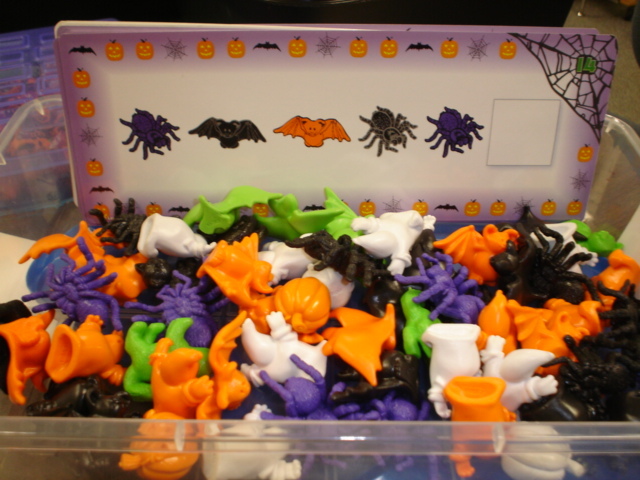 You get about 20 plastic shapes/characters and 15 cards and the kids can make various patterns (AB, AAB, ABAB, etc) They can be purchased with about 200 bonus points. I got 2 sets and I already had one from a few years ago. They also have had them in the past for the Winter holidays and Valentine’s day. I got these playing cards last September at the Dollar Spot at Target. I thought that the kids could pattern with them or the numbers on the other side.